Serves 6-8 people or 1-2 for a week! This past Saturday I rolled out of bed around 9:30 not wanting to waste my precious drops of weekend goodness, threw on some workout clothes and hit the street ... meandering. I sometimes go for walks, often go for runs, but rarely do I allow myself the unequivocal luxury of meandering. 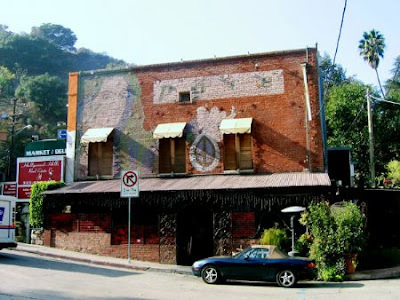 I strolled down Burton Way and crossed La Cienega, heading towards one of my favorite foodie spots in LA, Joan's on Third. The cafe au laits are smooth and made properly, with thick, creamy microfoam. (This is embarrassing but I had a dream last week that I was hired to visit every Starbucks in America to teach the baristas how to make microfoam and was appalled to learn most did not even know what that term meant.) Joan's offers so much more than some of the best coffee in Los Angeles. Think Dean and Deluca before they became a household name. Divine pastries, eclectic cheese, and charcuterie, all brazenly overpriced but somehow, sometimes, worth it. Somewhere between home and Joan's I was side tracked by something I love so much about LA: Banana Trees. I just can't get enough of the tropical R&R vibe they give off 365 days a year. And have you ever seen a banana tree flower?! If not, you're in for a non-edible, calories free treat mon amie. I finally made it to Joan's and ordered my much anticipated cafe au lait and a Maple Spice Cupcake. While waiting in line I started snapping photos for this blog and got in trouble ... no pics aloud indoors at Joan's ... whoops! Better to ask forgiveness, am I right? To my au lait I add 2 teaspoons of the divine cocoa powder they have along with a dash of cold, whole milk and one raw sugar pack. Stir, sip, smile, sit and enjoy the people watching. Post coffee and journal writing, I decide to save my cupcake and walk across the street to this tiny travel book store that looks straight out of a movie. I buy a birthday card for my ex-fiance and am not sure why I feel the need to do so. It read Ubuntu ... an ancient African word meaning, "I am what I am because of who we all are," and "Humanity to others." If you like this info read my other blog. Card in hand, I took third street back home passing a few more of my neighborhood go-to spots ... Bread Bar for good coffee, great Alpine Cheese bread and friendly service. Third Stop for weekday happy hour, above par bar food, and LA singletons. And last, Cafe Angelino for simple, reasonable Italian fare. Very good pizza and Caesar salad. Ah ... LA, I'm in love with you still after 6 years. This little French hideout is tucked just off Sunset in the artsy-chic Silver Lake neighborhood of which I'm becoming a HUGE fan. 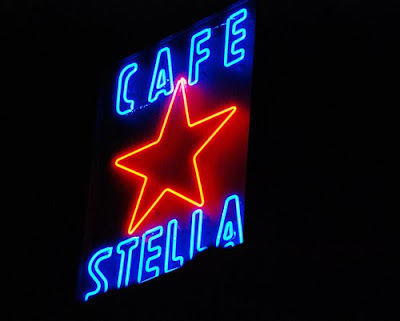 To find Cafe Stella, look for the red star. Seriously. Step into the beyond charming restaurant and let yourself, and perhaps your date, be whisked thousands of miles away to gay (as in happy) Paris :) The Red Bull buzz of Los Angeles seems oceans away as you sip wine and enjoy a rustic French inspired menu in an ambiance easily mistaken for a Parisian foodie form of heaven. Most of the seating is outside in a lovely courtyard, but we sat inside at the bar where there are also a few tables. The owner was eating a delish looking fish dish so we said "We want that." Sadly, it was a "tester" entree, but the awesome bartender was sweet and let us order one. A thick steak of the snow white Halibut came pan-seared with basil and baked-until-burst cherry tomatoes , all resting on a creamy, root vegetable puree. The presentation was more stunning than the actual flavor of the dish. Fresh, fresh fish ... yes. But bland. Tres bland. Divinely salty truffle fries made up for the in-need-of-flavor fish and we left feeling cozy, full, and starry eyed thanks to 2 glasses of vin(t hat's wine en Français) and deux Chimay Beers. L.A. loves people and places with "it factor." Having it can mean overnight success and Bistro LQ (open as of last Tuesday) definitely has it. With pure luck and the kindness of Maitre D' Eric Bouty, I was able to attend the third night of their soft opening last Monday. There is so much to say about this new gem that it’s taken a few days to gather my thoughts. Food writers aren't really allowed to get writer's block or we risk forgetting the flavors. So, I'll just plunge in with my first impression of Bistro LQ, named for Chef/Owner Laurent Quenioux(formerly of Bistro K and 7th Street Bistro). The space, once housing Mimosa, offers a simple, elegant respite from the chaos of the city. Cool blues and earthen tones quiet the mind and allow you to focus on the food. Whimsical glass bubbles hang from the ceiling and the servers don red Converse adding a bit of sparkle and humor to the room. This is not a stuffy, snooty French Bistro, but an inspired eatery with an avant-garde chef at the helm, blazing his own path to gastronomic heaven. The menu is the type you gush over, reading every line, oohing and aahing at the innovative options. Divided into Overtures (starters), Seas-Rivers-Oceans, Meat-Fowl, and Garden, the menu changes often depending on what's in season. You can choose a half order of most items which can make the meal more affordable and allows you to taste a greater variety of palatable pleasures. Prices range from $5 to $30. 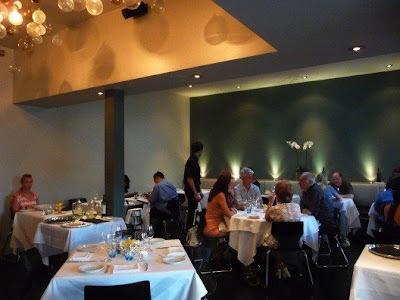 They also offer a six or nine course Degustation menu for $65 and $85. Finally, I had the stellar waiter help me decide what to order. Just when I thought it was time to sit back and revel in the anticipation of my coming meal, I was asked to order dessert, “… because the pastry chef takes so much time with each one," he explained. Fine with me! House made olive bread arrived followed by amuse-bouche of raw salmon in a yuzu sauce with seaweed threads. The blood-orange hue of the fish was striking and the buttery salmon paired well with the salty tang of the citrus sauce. Picking a starter with choices like Uni Tapioca Pudding, Pistachio Mousse, and Chanterelles with Veal Sweetbreads was so difficult, I chose two. First up, “Oat Meal,” infused with fennel lobster broth and cinnamon roasted Maine lobster. The combination of golden turmeric, spicy cinnamon and rich lobster permeated the creamy, piping hot cereal ... the result - decadence in a bowl. Next, Veal Cheeks and Pea Composition. The rich, braised veal in contrast with the delicate flavor of fresh peas done 3 ways was brilliant. The meat was indescribably good, so I'll just tell you, it was the best veal cheek I've had to date. Pea "guacamole" was a nifty concept, though somewhat flavorless. Pea gazpacho was cool and silky and the barely green pea shoot salad perfectly dressed. An oblong scoop of fresh corn sorbet was a sweet nod to summertime. Moving on to the sea but remaining cheeky, Monkfish Cheeks. This dish was all about textures that played well together: Creamy, buttery Cipollini Onion, firm, simply seasoned Monkfish and al dente artichoke confit all resting in a subtly sweet pool of pomegranate molasses. My final and favorite savory creation of the night was duck, tender, pink, and juicy, nestled on a bed of farro risotto with English sweet pea and fava bean mariniere. A shot glass of Campari Cucumber Gelee came on the side and while visually glamorous, was far too bitter for my palate. I take my Campari with a little sugar because I’m an infant when it comes to alcohol. After four generous half courses I was one blissed out foodie, eager to try the labor intensive desserts from pastry chef Mohamed Morseli. Fruit or Chocolate ... I had to choose so, of course, I went the chocolate route! Truly, EVERY SINGLE dessert listed was tempting, i.e. Rice Pudding in Goat Milk with Cassis Sorbet, Red Beet Espuma (that's Spanish for foam) and little truffles. Alas, I was dining alone and had room for only one dessert. #1) an intensely addicting chocolate soufflé style cake with Szechuan Peppercorns, all drenched in warm chocolate sauce. #2) a soft chocolate pancake cookie, sandwiched with creamy Mascarpone cheese. #3) a crème of chocolate, smooth, fluffy and perfectly sweet. But wait … there’s more! “What! ?” Yes, I know! The Mignardises (post-dessert series) deserves an honorable mention, as it was a grand dessert unto itself; chocolates, marshmallows, macaroons, financier, and Madeleine, all made in-house. - The five course tasting dessert menu; $30 per person. - The Johan Zerrouki and Chef L.Q. Cheese Cart with over 20 types of cheese from around the world and a variety of house-made condiments such as Sweet Onion Jam with Maple Syrup and Truffle Honey … my weakness!! Clearly, there is no shortage of imagination in the kitchen of Bistro LQ. New flavor combinations are brazenly presented to the world on white canvases weekly. This is a restaurant for the adventurous foodie who appreciates small details, big flavors, and a chef with a passion for creating masterpieces, with food as the medium. Innovative French Bistro with world fusion food and a focus on market fresh ingredients. A fun place that takes food very seriously. Good for adventurous eaters.